Crazy Quilt made up of irregularly shaped cotton and silk fabric pieces assembled around a central blue medallion featuring the embroidered letter "H." Each fabric piece is decorated with featherstitched outline embroidery, and some have painted designs and additional needlework. Pink sateen binding and backing. Tied with pink cotton yarn. The elaborate embroidered "H" at center stands for "Haywood." 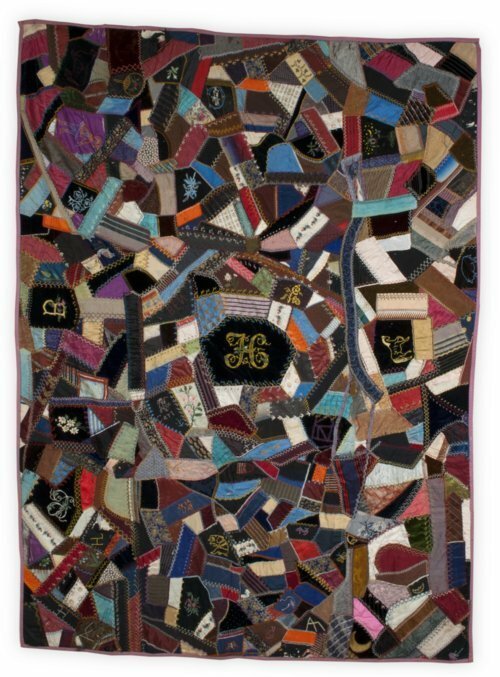 This quilt was begun in 1888 by Martha Hutchinson Haywood and used as a bedcover in the sod house she shared with her husband, Charles, and their children in Fowler, Kansas. The Haywood cattle brand appears on the quilt, as well as a horse depicting the steed ridden by Charles when Martha first saw him. The embroidered names "Carl" refer to the Haywoods' eldest son. The "C" may refer to their middle son Clarence, and the quilt also incorporates pieces of a graduation gown worn by their daughter, Nettie. "Ben" was Charles' brother.